Whether you are looking to practice Tai chi to maintain good health, dissolve physical and mental tension, breath better, learn to meditate or understand the martial aspects of this art we can help you achieve these goals. We teach traditional Wu style Tai Ji Quan (Tai chi) direct from the Wu family in Shanghai, and offer a full syllabus of methods including the long slow form, several weapons forms, pushing hands methods, and the fast form. In the beginning we start with simple movements that teach the principles behind all Tai chi & qi gong. How to stand, how to walk. How to dissolve tension downwards. How to breath deeply. How to connect the rotation in the waist with the rotation in the arms. How to move as one interconnected unit and how to connect Body breath and mind. These principles are the foundation of the Tai chi form and much of the first 10 weeks will be spent on getting the student to learn these principles before beginning to learn the form. During our life we accumulate much physical and mental tension and by learning something new such as Tai chi, we are offered an opportunity to put in place new physical and mental habits that can change who we are. 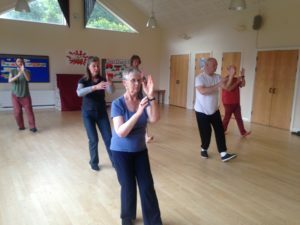 Tai chi is the physical manifestation of Taoist philosophical principles and so its practice can have a transformative effect on the human experience. Tai chi is a wonderful journey, but like all journeys, can be harder than expected at all stages, but especially in the beginning. Try to let go of your expectations or judgements and just be present with the experience of moving your body in a new way. Tai chi does not require anything special to reap its bountiful rewards other than practice, patience and perseverance.